Lighting-Gallery-net - good ol' mercury vapor/Verd a ray 175w merc from 1976 quite a find! Verd a ray 175w merc from 1976 quite a find! A friend found this in a trash bin. There was also another VAR, an actual safety type with filament fuse but was dead. This one appears to have low hours, works very well. Had to restore the etch with graphite. 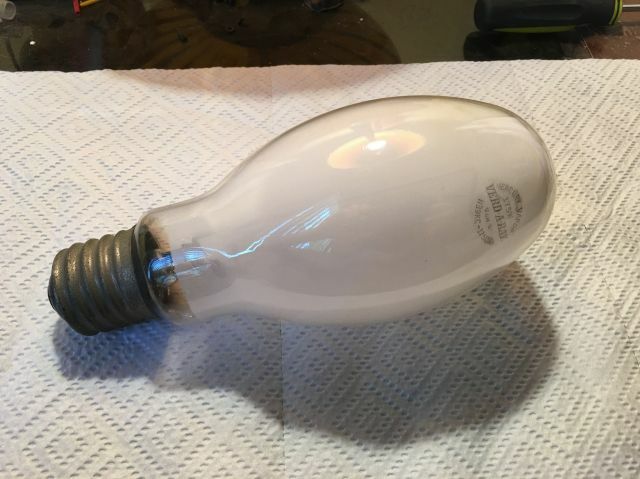 I compared this to a more recent Philips 175w MV lamp made at the Ya Ming plant in China. The arc tube and electrodes haven't changed much! Some other features are similar, but the VAR has threaded glass and pre-bent arc tube support supported directly by the stem press. Typical older Philips design. How do you "restore the etch"? Sprinkle it with graphite powder ? ?